Hempire is an amazing game that lets you take on the challenge of growing your own weed. While the game is definitely a ton of fun to play, sometimes you can get a little lost on what to do. For that reason we’ve created a list of the top 5 Hempire tips and tricks that will take you to the top of Hempire. Take advantage of the following 5 tips and tricks and elevate your Hempire gameplay to the next level. In Hempire there are quite a few different deals that you can complete. These deals give you rewards, but no all rewards are equal. Quite often the only rewards that you’ll get from quests are experience and cash. However, sometimes it’s the case that you will receive item rewards from completing certain deals. We highly recommend you to prioritize these deals because these items can come in very handy. For example, it’s possible for some deals to reward you with plank and nails which are crucial items to expand your shed. In theory it’s possible to obtain nails and planks from fixing benches, but it’s more efficient to complete deals that reward these items rather than repeatedly fixing benches. As you progress through Hempire you will unlock Wanda’s deals. You should definitely use Wanda’s deals to your advantage because they can reward you with diamonds, a good amount of cash, fertilizer, epic buds, edibles and oils, spare parts, and keys. All these items are very important in Hempire and it is therefore crucial to obtain them. Weed on Wheels is one of the most effective ways to obtain these resources. However, unlocking delivery slots in Weed on Wheels will cost you diamonds. Luckily for you, we’ve got you covered on that. 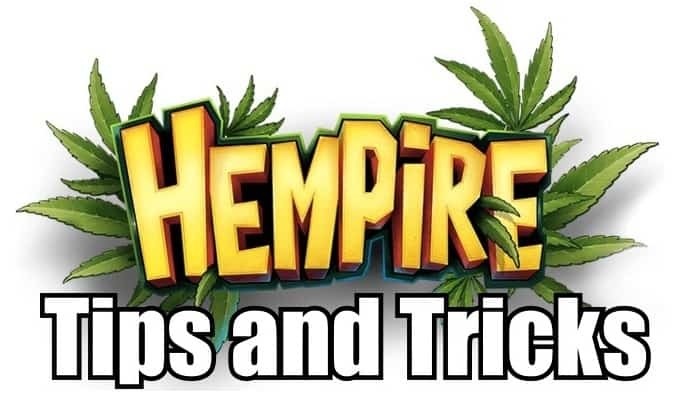 Check out our post about Cheats for Hempire to learn how to get free diamonds. There are a quite a few strains in Hempire, and learning how to breed all of them is quite a challenge. That’s why we have created a useful cheat sheet in our Hempire Strain Guide. It will teach you all the breeding combinations and contains information on how to obtain epic buds. It’s a must read if you’re serious about breeding in Hempire. This is quite a basic tip, but it’s important nonetheless. The quick select option can simplify your life in Hempire a huge deal. In the bottom right of your display you can see four buttons. These four buttons represent a shortcut to your facilities. If you want to go to one of your facilities you can simply tap the corresponding button and you’ll be brought to it. You’ll want to use this because it allows you to more easily water your plants in time which is crucial if you want to obtain perfect harvests. These are crucial buildings that you should upgrade asap. In order to upgrade buildings you often need specific items. A quick tip to figure out where you can find the items that you need to upgrade a building is to tap and hold the item. It will then show you where you can find that specific item. Some items are harder to find than others. Watering cans for example can be found in trash bins but other items are much harder to obtain. These 5 tips and tricks for Hempire should help you get started on your journey. We hope that you found them helpful and if you have any questions then feel free to leave a comment. Furthermore, if you have any other tips that you would like us to feature in this guide then you can also leave a comment and we’ll implement it in our guide.